The U.S. and E.U. : Have They Ever Been in Such Terrible Shape? This is no time for gloating, neither for Americans nor for Europeans. For both sides are in deep economic trouble, only in different ways. The U.S. runs the worst deficit (as share of GDP) since World War II, and yet Keynesianism to the max won’t budge the unemployment rate—pace Professors Krugman and Stiglitz. What does fall is the dollar and the price of real estate, a double-whammy if ever there was one. The euro, meanwhile, may be rising, at least against the greenback, but the common currency, now ten years old, is about as stable as was Confederate script back in the Civil War. “Civil war,” actually, is not a bad way to describe the state of Euroland. On one side, there are the “PIIGS”—Portugal, Ireland, Italy, Greece, and Spain—looking at bankruptcy. In fact, Greece is bankrupt. Its foreign debt exceeds its GDP by about one-half, and, as slices of it come due, it cannot possibly redeem the bonds without yet another infusion of cash from Europe and the International Monetary Fund (IMF). Government outlays keep rising, while tax receipts are falling (year-on-year). So austerity does not work—except in the streets of Athens, where the angry masses revolt against a tottering government. On the other side are France and Germany, the two heavies of the E.U. economy (Britain is in as much trouble as the U.S., but outside the euro). Their banks groan under a hefty exposure to Greek debt, French banks more than their German counterparts. So neither Berlin nor Paris wants the Greeks to default. But the two of them have their own little civil war. Nicholas Sarkozy wants to put Greece on welfare as long as it takes, counting on Germany—the biggest and richest country in Euroland—to foot the largest part of the bill. Angela Merkel, well aware of this unending drain, wants to impose fiscal discipline and market reforms on Athens. In the latest spat, Merkel, who is not as enamored of state action as her French counterpart, wanted to drag in banks, pension funds, and insurance companies by making them roll over Greek debt by seven years. This would be a default in everything but name, and so the French balked. Merkel, always tougher at the outset than at the end, finally relented. Participation by the private sector now is to be “voluntary.” So far, though, there haven’t been too many volunteers. 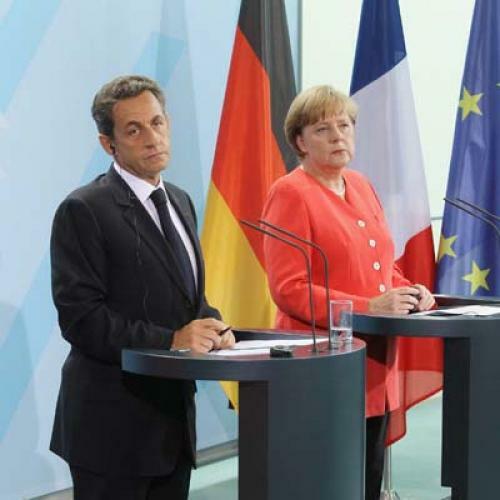 This mano-a-mano is typical for Germany and France, who are always vying for the leadership of Europe. But it is patty-cakes compared to the other horrors the monetary union has wrought, and not for lack of warning. As many economists cried out in the run-up to the euro 15 years ago, in monetary policy, one size won’t fit all—certainly not a bunch of diverging economies untrammeled by common governance. And, indeed, the euro, instead of forcing member states into fiscal convergence, has only accentuated the bad habits of the PIIGS. These countries had always lived beyond their means. With the euro, however, they could suddenly spend like Italians, but borrow like Germans, at low rates. Bond spreads converged between the spendthrifts and the tightwads, but not basic policies. Indeed, cheap money encouraged even more profligacy—worst of all in Greece (which also managed to cheat on its financial statistics before and after entering the euro). This is where we are now: With Greek two-year bonds fetching almost 30 percent, the markets are growling that Hellas is doomed. Both Merkel and Sarkozy dread the looming default as “Lehman squared“—and so, by the way, does Washington. So, too, does the IMF, which wants to withhold a critical $12 billion pay-out to the Greeks unless the E.U. swears a holy oath on bailing out Athens, come what may. Europe will inevitably buy time by handing over a few more slices of bail-out money to Greece, even though, one day, the country will default. With 50 cents of the euro, it will halve its debt as well as its repayments and thus buy more time. The E.U., meanwhile, still won’t have any idea where it’s going or how to handle the crisis long-term. But what else is new? Twenty-seven governments do not a “more perfect union” make. Certainly not when the natural leader, which is Germany by dint of wealth and weight, sounds such an uncertain trumpet as it has under Chancellor Merkel. Yet what, exactly, is she supposed to do when the chickens of an ill-designed monetary union have finally come home to roost? Neither she nor Sarkozy can undo the mismanagement of the PIIGS in one fell swoop. Meanwhile, back to the United States—to its still-sinking dollar and rising unemployment. It is hard to think of a time when both the U.S. and the E.U., the two biggest players in the international economy, were in such miserable shape. We are talking about two giants with a total of 50 percent of global GDP. Who will save them? Josef Joffe is the editor of Die Zeit in Hamburg Germany. He is also a senior fellow at the Freeman-Spogli Institute for International Studies and Abramowitz Fellow at the Hoover Institution, both at Stanford.